The award winning lineup of Few Spirits is now available in Washington State. 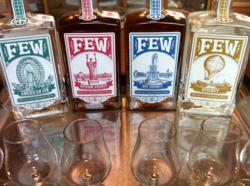 FEW Spirits, has recently found a home for their exceptional small-batch spirits in Seattle, Washington. Motivated by the enigmatic inspiration of the Temperance movement, FEW Spirits creates tradition through timeless liquors that are barreled and bottled in-house. Two fine dining venues located in the heart of western Washington are fortunate to welcome FEW Spirits’ White Whiskey, American Gin, Rye Whiskey, and Bourbon Whiskey in to their menu. The first of the two, Re:Public, was recently voted as the #1 New Restaurant in Western Washington by Evening Magazine. It has been described as both the “latest It restaurant bar” as well as having no less than “high-density blocks of surging businesses.” Rhuadri McCormick, whose family owns Kell’s Irish Restaurant and Pub and who himself opened Post along with co-owner Hannes Schindler, another partner in Re:Public, is introducing seven new FEW cocktails to be featured on the menu this season. The third co-owner, Matthew Greenup, was one of the founders of Mission Latin Restaurant and Lounge in West Seattle. Chef Martin Woods, an alumnus of Cantinetta and Bastille, provides the foundation for a unforgettable cuisine to complement a FEW spirit of choice. The second metropolitan-Seattle lounge is found at Toulouse Petit, a tasteful dining experience chosen by CNBC’s nation-wide survey as one of the Ten Best Happy Hours in the Nation. Chefs Eric Donnelly and Brian Hutmacher have fostered an environment in which Toulouse Petit has come to be illustrated as “A Queen Ann favorite featuring Seattle’s best happy hour, New Orleans cuisine, and a fabulous cocktail list.” On that fabulous cocktail list is now the FEW Bloody Mary, made with FEW’s bottled-before-it-meets-the-barrel acclaimed White Whiskey. Yes, the same White Whiskey that won the Double Gold at the New York International Wine & Spirits and the Gold at the International Review of Spirits this past year. FEW Spirits has been critically acclaimed by many, as well as featured in both the Chicago Tribune and Whisky Magazine, among other fine publications. Additionally, FEW has received many positive acclamations, including the aforementioned awards at the New York International Wine & Spirits Competition and International Review of Spirits, as well as a "Highly Recommended" rating from the Beverage Tasting Institute. For further news and information, or where to discover the recipe for a FEW Martini, log on to fewspirits.com.